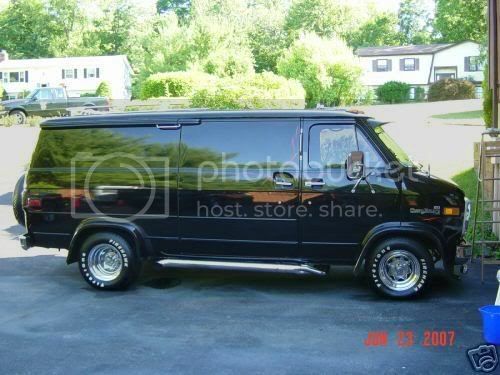 Great looking van, lots of pics, that is the way to present something a person wants to sell. Could use a few more pics of the girl. Some of the interior pics don't match up to the exterior. It shows porthole windows on the inside but none on the outside. Different seats can be seen through the windows than what are in the van. Jurassic Park stickers in some photos and not in others. I suppose all of this could have been added and the pictures taken at different times. In the Video it shows a bench and windows on the drivers side like a window van. Probably just a wrong pic loaded in. I noticed the same thing, that some of the photos don't match up. The huge bolts they used to install them ports would probably hold a window on a submarine or tank. I thought right away the first few pics appear to be older. Somethin with this ad is fishy to me ,to many discrepencies in the pics posted !